Supplement to breastfeeding or as a complet breast milk substitute. High quality infant formula suitable for infants from birth (stage 1). 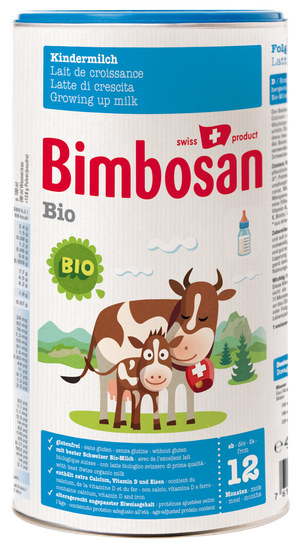 It is made of 100% best Swiss organic milk, is savory, nourishing and very easily digestible thanks to its special formulation. Contains no gluten, sugar or starch. Recommended for use in combination with breastfeeding or as a complete breast milk substitute. Premium Swiss Quality. As a complete breast milk substitute for bottle feeding. As a supplement to breastfeeding if the mother's milk is not nourishing enough. Boil the indicated quantity of water and let it cool down to about 45°C. 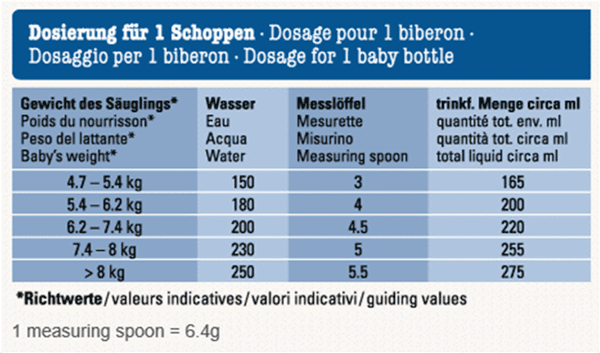 Add the required number of measuring spoons of Bimbosan Organic Infant Starter Milk Powder and shake or mix well. For bottles exceeding 160 ml: Fill in half the water, add the powder and shake well. Add the rest of water and shake well again. After 4 months you add a Bimbosan bottle supplement according to the infants special needs. Use boiled water, cooled down to the recommended temperature. Too hot water, may damage important vitamins and minerals in the Infant formula. Prepare each bottle freshly, do not use leftovers. Incorrect storage or bad preparation may damage the health. Supplement to breastfeeding or as a complet breast milk substitute, for lactose-free, vegetarian and vegan diet. High quality infant formula based on soy-based proteins suitable for infants from birth (stage 1). It is made of GMO free soy milk with vegetable proteins and balanced ingredients. For lactose-free, vegetarian or vegan diet. Contains no gluten, sugar or starch. Recommended for use in combination with breastfeeding or as a complete breast milk substitute. Premium Swiss Quality. As a complete breast milk substitute for bottle feeding. As a supplement to breastfeeding if the mother's milk is not nourishing enough. For vegetarian, vegan and lactose-free diet. Boil the indicated quantity of water and let it cool down to about 45°C. Too hot water, may damage important vitamins and minerals. Add the required number of measuring spoons of Bimbosan Bisoja Infant Starter Soy-Milk Powder and shake or mix well. Glucose syrup, vegetable oils (structured palm oil, sunflower oil, rapeseed oil, lineseed oil), isolated soy protein (14%), calcium phosphate, potassium chloride, potassium citrate, magnesium chloride, sodium citrate, iron gluconate, zinc sulfate, copper sulfate, potassium iodate, sodium selenite, emulsifier (mono- and diglycerides of fatty acids), vitamin C, niacin, vitamin E, pantothenic acid, vitamin B2, vitamin A, vitamin B1, vitamin B6, folic acid, vitamin K, biotin, vitamin D, vitamin B12, choline, taurine, inositol, methionine, L-carnitine. High quality follow-on formula suitable for babies from 6 months (stage 2). It is made of 100% best Swiss organic milk, is savory, nourishing and very easily digestible thanks to its special formulation. Contains no gluten, sugar or starch. 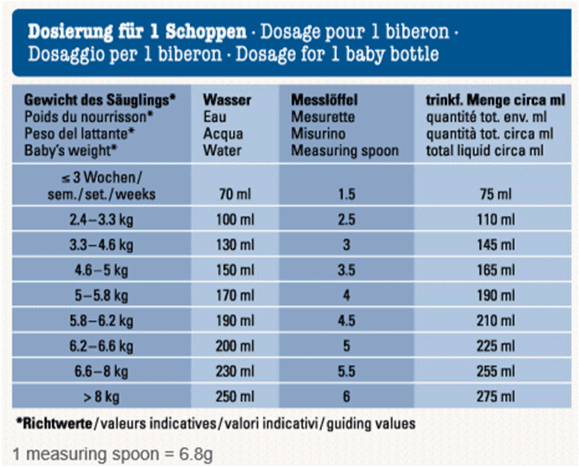 Recommended for use after the introduction of supplementary food following breastfeeding or infant formula. Premium Swiss Quality. 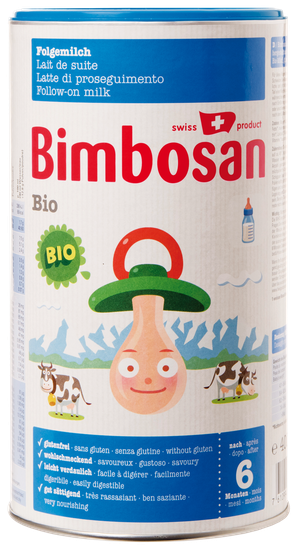 Add the required number of measuring spoons of Bimbosan Organic Baby Follow On Milk Powder and shake or mix well. Skimmed milk*, whole milk*, vegetable oils and fats (rapeseed oil*, sunflower oil*, palm oil*, palm kernel oil*), demineralized whey powder*, maltodextrin*, lactose*, whey protein concentrate*, calcium citrate, potassium citrate, sodium hydrogenphosphate, iron (II) gluconate, magnesium chloride, zinc sulfate, copper sulfate, manganese sulfate, potassium iodate, sodium selenite, vitamin C, vitamin E, niacin, pantothenic acid, vitamin A, vitamin B1, vitamin B6, folic acid, vitamin K, biotin, vitamin D, vitamin B2, vitamin B12. High quality growing-up formula suitable for toddlers from 12 months (stage 3). It is made of 100% best Swiss organic milk and extra calcium, vitamin D, iron and protein to provide the best nutrition for healthy growth. Contains no gluten, sugar or starch. Recommended for use together with supplementary food following breastfeeding or infant formula. Premium Swiss Quality. Skimmed milk*, whole milk*, maltodextrin*, vegetable oils (rapeseed oil*), sunflower oil*, palm oil*, palm kernel oil*, lactose*, minerals (calcium phosphate, sodium citrate, Iron (II), gluconate, magnesium chloride, potassium citrate, zinc sulfate, cooper sulfate, manganese sulfate, potassium iodate, sodium selenate), vitamins (vitamin C, vitamin E, niacin, pantothenic acid, vitamin A, vitamin B1, vitamin B6, folic acid, vitamin K, biotin, vitamin D, vitamin B2, vitamin B12).